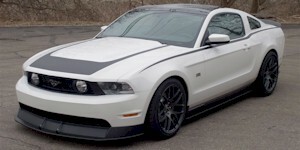 2011 The dealer installed RTR option package is available on the GT and V6 Mustangs. The options package is designed by Vaughn Gittin Jr. Unique items include special front chin spoiler with splitter, side rockers, rear diffuser, aluminum rear decklid spoiler, special stripes, RTR badges inside and out, RTR floor mats, RTR 19x9.5-inch wheels, Falken FK452 performance tires, Ford Racing shocks, Ford Racing 1.5-inch lowering springs, upgraded rear sway bar, cross-drilled and slotted rotors, Ford racing tune, K&N air filter, and low flow mufflers.